Alex Iwobi has been discharged from hospital and is ready to make his competitive debut for Nigeria. The Super Eagles host Egypt on Friday in their African Cup of Nations qualifier and there had been fears Iwobi - hospitalised with food poisoning - would be unavailable. But the Arsenal star dismissed those suggestions, tweeting: "Had the maddest food poisoning but I am good now and feeling ready for the Egyptian match." Iwobi has been at the centre of a tussle between England and Nigeria recently, with the former trying to tempt him to play for them rather than the country of his birth. 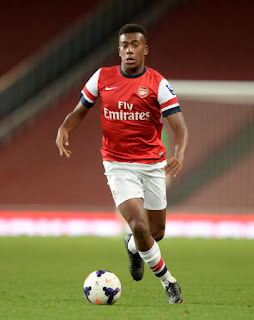 The 19-year-old represented England at various youth levels before playing two friendlies for Nigeria's senior team. But after his rise to prominence at Arsenal this season, the FA made one last attempt persuade him to return. Iwobi, however, rejected their advances and is now set to seal his status as a Nigeria international by facing Egypt on Friday.